Marketing automation is everywhere—except it isn’t. It’s written about ad nauseum, and you’ve probably weighed the pros and cons of implementing or shifting to a new automation platform dozens of times. And yet, even with a decade of usage, most organizations are still dealing with core deficiencies that prevent automation. The most glaring of issues centers around the implementation of automation to scale broken processes. Based on data collected in our latest benchmarking report, we see marketing still stuck in the middle of a fire, without a fire extinguisher. As marketers, we will always have to deal with important and time-consuming projects which seem to arise daily. We’re in the fast-paced world of marketing, there’s never any time to catch your breath. But that’s precisely why automation is so crucial; without it, you’re either letting data pile up with no way to reign it in, or you’re letting golden opportunities slip through the cracks because you’re too distracted. If it’s cost that worries you, have you considered the cost of not implementing automation? How much money have you already poured down the drain playing catch-up with your pipeline or wasting resources by not having a data-backed strategy for rolling out content? Every day you push back against marketing automation is another day of lost opportunity. Buyers are changing their habits on a near-daily basis, and it’s unfair to yourself to think you can recognize every nuanced trend driving and tracking behavior on your own. Even if things are going well and business is good, applying scale to that model will undoubtedly mean adding technology. Companies are often scared off by the “automation” term because of the negative connotations of “one size fits all” messaging. The purpose of marketing automation is not to remove personalization, but instead to remove the manual steps in your marketing process that hamstring it. It rarely feels like the “right” time to tackle a big project like implementing an automation platform. In actuality, the right time is right now. Your brand is suffering in the eyes of your audience with every useless email you send, and your website is languishing on the third page of search results because you haven’t properly leveraged your content investments. Even if you think you’re doing everything right, you don’t know if it’s sustainable unless you solidify a process that guarantees success. Your marketing automation team should be thought of as an investment as much as the software itself. Over time, as efficiency increases and you learn to identify weaknesses and convert them to strengths, your ROI grows tremendously. Are you going to have to bring more people in? Probably, there is no simple “hack” that will fill a vital role within an automated environment. Your graphic designer, for example, can do his or her best work when freed up from having to interpret data, just as an analytics manager can focus on numbers, not content. When everyone is acutely aware of their role, internal communication improves, and guesswork (and resentment over being put in a position to fail) is eliminated. When Marketo or another software gets delivered to your door, it can feel like Christmas morning. But just like rushing to send a remote control car over some sweet jumps without putting in batteries, diving into next-level tech with the team you currently have may lead to more stops than starts. Pretty soon, you’re blaming the technology and ordering new pieces, destroying your budget, and exacerbating your problem: You still don’t have the right team to use this stuff. Some companies choose to work with an outside firm that specializes in automation software implementation, especially if they’re green to the whole idea. There’s nothing wrong with this approach at the outset, but hiring the right people is an investment that pays your organization back in the long run. Even if you continue to work with agencies, you’ll want an internal operations layer for speed. Whatever you do, don’t put out job notices for “Marketing Automation Wizard,” as these mythical all-around savants do not exist. Instead, focus on your goals and business objectives to influence who you add to your team. Where are you deficient? Who’s executing what? How can you make sure that each team member is required to wear as few hats as possible while being well-versed in communicating with others about different components of automation? Everyone will be working from the same set of standards within an automation program and should clearly know how their skills complement the entire team. You’re used to a certain language and set of rules with whatever system you were using before, so you might find it awkward to interview candidates who may speak an entirely different language. Don’t feel bad—there aren’t too many people who fully grasp automation best practices, even today. That’s why interview questions that focus on details and methodologies will quickly reveal the experts in a field of pretenders. 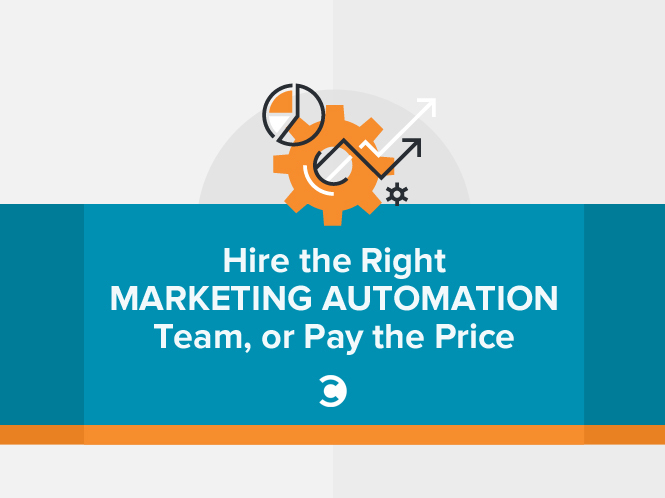 Marketing automation, and specifically the cost of implementation, is nothing to be feared. Automated technology is designed to lift your organization onto another level of demand generation, marketing program ROI, and customer loyalty. Seismic shifts aren’t always easy, but they’ll never happen properly if you aren’t willing to invest in the team that understands the tech.